Mardi Gras , also Fat Tuesday in English, refers to events of the Carnival celebrations, beginning on or after the Epiphany or King's Day and culminating on the day before Ash Wednesday. Mardi Gras is French for "Fat Tuesday", reflecting the practice of the last night of eating richer, fatty foods before the ritual fasting of the Lenten season. Related popular practices are associated with celebrations before the fasting and religious obligations associated with the penitential season of Lent. The date of Fat Tuesday coincides with that of celebrations of Shrove Tuesday, from the word shrive, meaning "confess". Popular practices on Mardi Gras include wearing masks and costumes, overturning social conventions, dancing, sports competitions, parades, debauchery, etc. 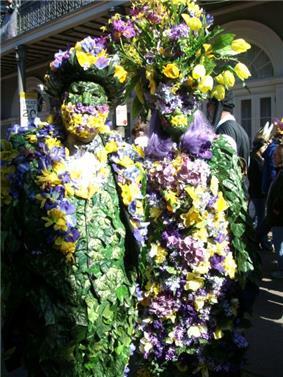 Similar expressions to Mardi Gras appear in other European languages sharing the Christian tradition, as it is associated with the religious requirement for confession before Lent begins. In many areas, the term "Mardi Gras" has come to mean the whole period of activity related to the celebratory events, beyond just the single day. In some American cities, it is now called "Mardi Gras Day". It also has become a single people's counter to the coupled-centric Valentine's Day. The celebration of Mardi Gras in Germany is called Karneval, Fastnacht, depending on the region. Fastnacht means "Eve of the Fast", but all three terms cover the whole carnival season with famous parades held in Cologne, Mainz, and Düsseldorf on the Monday before Ash Wednesday, called Rosenmontag (Rose Monday). The traditional start of the carnival season is on November 11 at 11:11am (11/11 11:11). 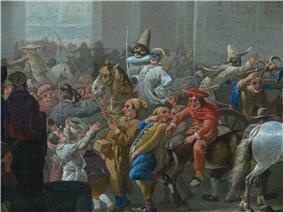 In Italy Mardi Gras is called Martedí Grasso (Fat Tuesday). It's the main day of Carnival along with the Thursday before, called Giovedí Grasso (Fat Thursday), which ratifies the start of the celebrations. 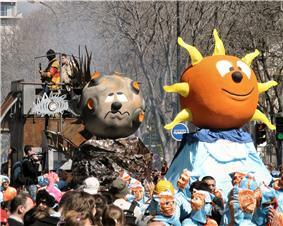 The most famous Carnivals in Italy are in Venice, Viareggio and Ivrea. Ivrea has the characteristic "Battle of Oranges" that finds its roots in medieval times. Italy is the birthplace of Carnival celebrations, having its origins in the ancient Roman festival of Saturnalia. The Italian version of the festival is spelled Carnevale. 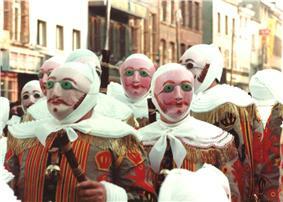 The Netherlands also has a festival similar to Mardi Gras. It's called Carnaval and is similar to the Venice Carnival. The origin of the word Carnaval is 'Carne Vale' which means "Goodbye to the meat" in Latin. It marks the beginning of lent leading up to Easter. In Sweden the celebration is called Fastan, when you eat fastlagsbulle, also called Fettisdagsbulle . That name comes from the words "fett" (fat) and "tisdag" (Tuesday). Originally, this was the only day one should eat fastlagsbullar. ^ a b In London, Mardi Gras season: "Paul's Pastry Shop kneads a ton of dough in Picayune", Allbusiness.com, 2009, webpage: Allbusiness-35. ^ a b In New Orleans, Mardi Gras season: "Mardi Gras in New Orleans | Metro.co.uk", Metro.co.uk, 2009, webpage; Metro.co.uk-2315. ^ a b In Mobile, Mardi Gras season: "New Orleans has competition for Mardi Gras", USATODAY.com, February 2006, webpage: USATODAY-com-mardi. ^ a b In San Diego, Mardi Gras season: "sandiego.com - Mardi Gras in San Diego: FAQ's", SanDiego.com, 2008, webpage: SanDiego.com-SD. ^ a b c In Texas, Mardi Gras season: "Let’s Celebrate: Mardi Gras 2008", Southernbyways.com, January 2008, webpage: southernbyways-com-TX. ^ a b Melitta Weiss Adamson, Francine Segan (2008). Entertaining from Ancient Rome to the Super Bowl. 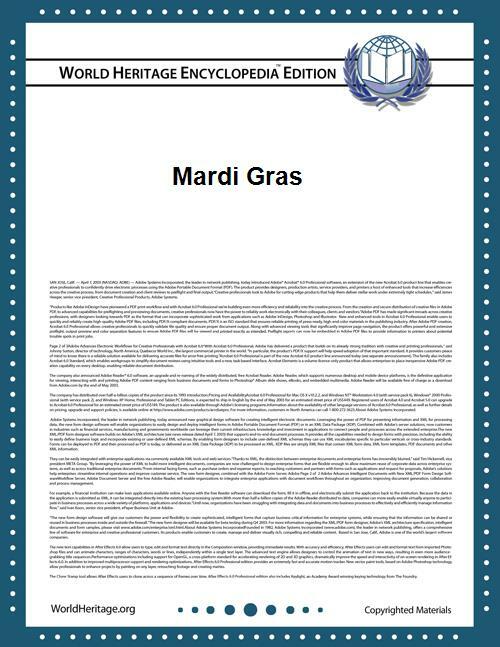 ^ a b c "Mardi Gras Terminology". "Mobile Bay Convention & Visitors Bureau". Retrieved November 18, 2007. ^ "The Season of Lent". Crivoice.org. January 7, 2010. Retrieved October 16, 2010. ^ "Mobile Carnival Association, 1927", MardiGrasDigest.com, 2006, webpage: mardigrasdigest-Mobile. ^ "Swedish semla: more than just a bun". Sweden.se. Retrieved February 22, 2011. ^ a b c d e "New Orleans & Mardi Gras History Timeline " (event list), Mardi Gras Digest, 2005, webpage: MG-time. ^ a b "Timeline 18th Century:" (events), Timelines of History, 2007, webpage: TLine-1700-1724: on "1702-1711" of Mobile. ^ a b "Carnival/Mobile Mardi Gras Timeline". Museum of Mobile. Museum of Mobile. Retrieved July 18, 2012. ^ "Mardi Gras in Rural Acadiana". Retrieved February 18, 2010. In 1723, the capital of Louisiana was moved to New Orleans, founded in 1718. 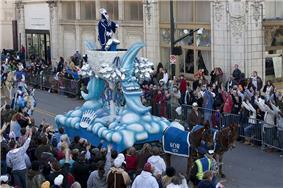 The first Mardi Gras parade held in New Orleans is recorded to have taken place in 1837. The tradition in New Orleans expanded to the point that it became synonymous with the city in popular perception, and embraced by residents of New Orleans beyond those of French or Catholic heritage. Mardi Gras celebrations are part of the basis of the slogan, Laissez les bons temps rouler, (Let the good times roll). Other cities along the Gulf Coast with early French colonial heritage, from Pensacola, Florida; Galveston, Texas; to Lafayette, Louisiana, have active Mardi Gras celebrations in balls. In the rural Acadiana area, many Cajuns celebrate with the Courir de Mardi Gras, a tradition that dates to medieval celebrations in France.